In an increasingly interconnected world it's important to incorporate the ideas of our best and brightest collective minds. To this end, the Global Forum for Physical Education Pedagogy (GoFPEP) "was founded by Prof. Dr. Christopher R. Edginton and Prof. Dr. Ming-kai Chin as a global 'think tank' designed to rethink, reform and reframe physical education pedagogy. Awareness raising, identity re-branding, and strategy re-adjustment continue to be the key components of the forum’s focus to foster field change. GoFPEP is recognized for the depth and range of its roster of world renowned speakers, workshops and model school presentations showcasing best practices from different countries/regions, school and community program implementation and site visits, and most importantly expanded opportunities for shared dialog and discovery. GoFPEP is uniquely constructed for delegates to continue to work locally while connecting globally. The end goal is for sustainable behavioral change, and while this may vary in look from community to country, GoFPEP provides the structure for a sharing of local perspectives within a global construct as a means to this achievable end." Tom Root, Founder and CEO of HOPSports had this to say in the foreword of GoFPEP's most recent publication, "To think that technology is not a critical component in our perception of health and wellness, the linking role of PE, and even the participation in physical activity is antiquated at best and irresponsible at worst. Technology is often viewed in physical education circles as 'the enemy' leading to more sedentary lifestyles, which in turn lead to increases in the rate of obesity and diabetes. However, technology can play a constructive role as well, increasing access to new forms of physical activity based on traditional dances, martial arts, and sports. We can say to our children with endless repetition, 'Exercise and play more, watch what you eat,' but to drive the message home we must utilize what they already have at their disposal: smartphones, iPads, and computers." Play has always been at the core of a healthy childhood. However, we must recognize that today’s generation plays and creates in entirely different ways due to technology. It is a generation of choice, and we must provide opportunities to exercise and play on demand, in any setting. In cities and countries around the globe, a new generation is being born into a world where technology is omnipresent. Youth are connecting and socializing instantaneously through technology, playing games, and creating new forms of expression. Recently, I watched a young child newly forming words marvel at a turn-off, turn-on heat-radiating, temperature-regulating fireplace (itself a wonder). When asked, "Is this magic?" he confidently replied, "No, remote." Technology renders instant access, comprehension, and knowledge, enabling communication at unprecedented speed with unparalleled potential. Technology has the power to transform our behavior and activity as well as the ability to track and measure our preferences and performance. 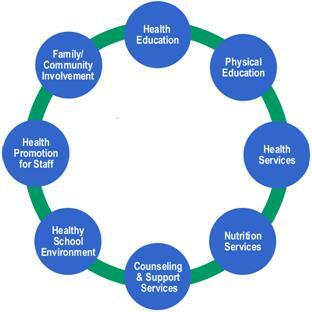 At this critical apex, we are uniquely positioned to follow the Coordinated School Health Model to link health, education, and communities to change direction and lives for the better. A child needs to feel safe and be healthy to be primed for learning and knowledge retention. Corporations, professional sports teams, hospitals, health agencies, recreation facilities, and service providers are joining forces to disseminate health practices customized to the unique needs of each individual community. Through this collaborative and comprehensive approach, the effectiveness of the message is maximized and future health care and safety costs are minimized. Community stakeholders are afforded the valued position of educating the future workforce while promoting individual and community wellness. Through technology we may visually and virtually share best practices of school and community to transform thought, shape policy, and find curative solutions. The Global Forum on Physical Education Pedagogy gathers scholars, physical and health educators, and industry leaders worldwide to stimulate new ways of thinking informed by established practice. The forum showcases school and community best practices in real time for real solutions. In today’s modern world, we would do well to remind ourselves of the wisdom of the ancients: that what impacts the individual imprints the greater community at large. Technology instantly connects us to vistas unimagined, allowing the free flow of information and ideas regardless of geographical boundaries or cultural differences. "Increasing prevalence of obesity in all age categories in both male and female populations has been shown globally in the last decade or so. In adults, obesity is mostly accompanied by various health problems such as diabetes, diseases of the cardiovascular system, orthopedic problems, and many others, to name a few. In addition, morbidity and mortality are shown to be increased due to obesity. The health situation is worse when obesity and lack of physical activity develop (couch potato children) during childhood. Through 21st century technology mediums, children experience a variety of sensory distractions which enable the repetition of standards-based sport and fitness skill development. Kids may simultaneously watch wellness-themed animated videos, choose modern music, or learn valuable educational and social messaging while increasing their moderate to vigorous physical activity (MVPA). Brain Breaks are web-based 2-5 minute activity breaks designed for the individual classroom setting. Without any additional planning or preparation time teachers have an instant additional resource tool to revitalize the classroom environment and activate student learning. Classroom teachers are continually asked to do more with less, and Brain Breaks help increase test scores and fulfill mandates for increased physical activity and nutrition education without compromising valuable instructional time. HOPSports®, Inc. is a global health and wellness network reaching classrooms, schools, homes, workplaces and community centers. It’s innovative digital platform combines physical activity with education and entertainment to provide a cost-effective and research proven wellness solution. Its innovative, digital platform combines physical activity with education and entertainment to provide cost-effective and research proven wellness solutions. Brain Breaks® are web-based 2-5 minute activity breaks designed for the individual classroom setting. Without any additional planning or preparation time, teachers have an instant additional resource tool to revitalize the classroom environment and activate student learning. Classroom teachers are continually asked to do more with less, and Brain Breaks help improve test scores and fulfill mandates for increased physical activity and nutrition education without compromising valuable instructional time. HOPSports’ names and logos and all related trademarks and registered trademarks (including Brain Breaks® and HOPSports®), tradenames, and other intellectual property are the exclusive property of HOPSports and cannot be used without its express prior written permission. 2019 © HOPSports®. ALL Rights Reserved.